What a year it's been. In May, Rebecca and I were finally able to get married after so many delays. Then in November we welcomed our new baby, Alexis. Our two older girls are thriving in school and growing up so fast. On a personal level, 2010 was the best year I've ever had. On the writing front, it was a pretty good year as well, although not as productive as I would have liked. I finished (not wrote) two novels. One of them, Red Moon Rising will be released by Sam's Dot Publishing in February. The other is getting some serious consideration from another publisher...so hopefully there will be some good news in early 2011. I only wrote three short stories this year. Two of those stories will be published in 2011, and I'm waiting to hear back on the third. I did a lot of writing for the Ephemeris RPG, and although sales on the game haven't been booming, we have seen fairly steady sales year round. So, overall, I would have to say that 2010 was a damn good year! Around here, we don't celebrate Christmas as being the birth of a god, or the birth of a son of a god. Instead, we just celebrate it as a time to be with family and friends. So, to all of my family and friends, Merry Christmas. I'm having a lot of trouble adjusting to having the baby in the house and working early in the morning. My new job starts at 6 am every day, so I have to be up at 4:30, and of course, anyone who has ever had a baby will tell you that they don't sleep through the night. At first, Rebecca was doing a lot of the staying up with her because she was still on maternity leave, but she went back to work last night...and Alexis was not too happy about it. We had a very rough night with her basically screaming for hours on end. So, I didn't get to sleep until Rebecca got home at midnight. Tonight's been a much better night so far. Normally she wants to be held whenever she's sleeping, but I've been splitting time between that and putting her in the car seat next to my desk and gently rocking her. She hasn't had any fits yet, and she seems quite happy...so it seems to be working. 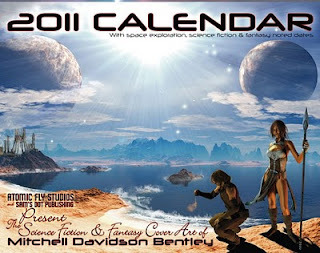 If you're looking for a great gift idea for the science fiction or fantasy fan on your holiday list, might I suggest the Sam's Dot Publishing calendars? Not only do these calendars feature the usual holiday dates, they also feature important dates like the birthdays of some of your favorite authors, the dates of major literary and scientific achievements, and much more. You can find them at The Genre Mall. 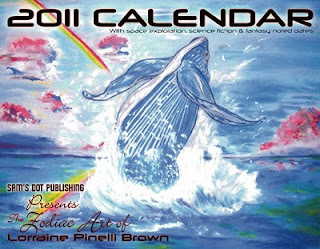 Just scroll down to the Sam's Dot Calendars. I finished the story I was asked to write for an anthology. The actual deadline was the end of November, but the editor is a nice person, and she gave me extra time since I was quite busy during November, and because I was losing a lot of sleep due to the new addition to our family. I still feel like my short story skills are a bit rusty, but I'm two for two on the stories I've written so far this year, so maybe I just don't know what I'm talking about. Hopefully the story will be accepted. It would be a new publisher for me, and a publisher who puts out some good books, so I would certainly be happy to see my name in one of their collections.